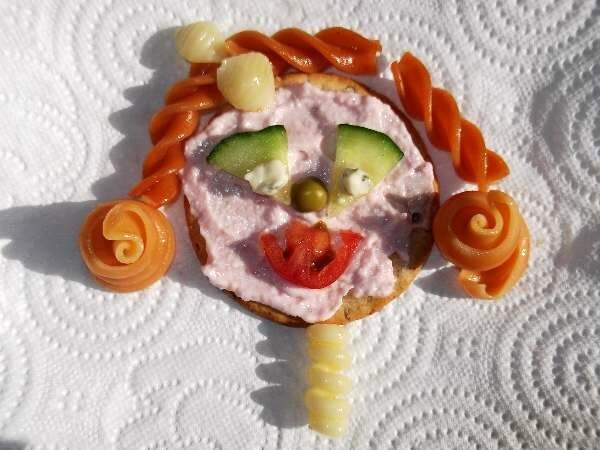 Introduce your child to good nutrition by these edible crafts for kids. You will soon be brimming with ideas once you see how easy it is. The kids will love making these funny faces. They will no doubt create some peculiar ones themselves. You will need to prepare all the ingredients first and then the kids will do the rest. 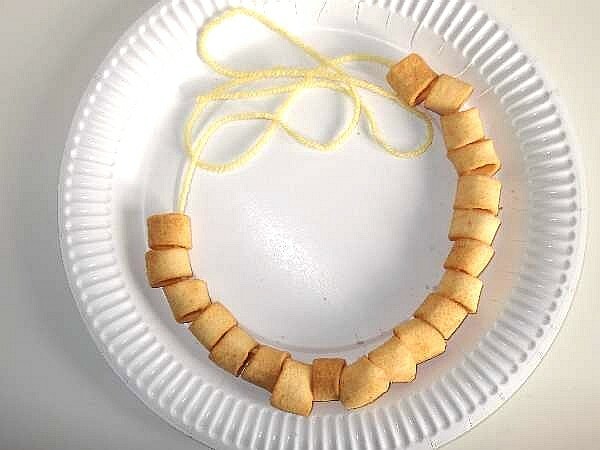 Most kids like pasta and it`s delicious hot or cold, ideal for preschool crafts. I have added 8 different shapes. The more shapes and colors there is, the more creative the children will be! Notice the red, green and cream? These common pastas contain spinach in the green, carrots in the red, and unsweetened chocolate in the brown if you can get hold of it. A variety helps give the kids the nutrition they need. Add a little olive oil after cooking to keep it from sticking together when it cools. But don`t worry about them refusing to eat! Their attention is on having fun. My husband and I used a fun method to get one of our grandsons to eat veggies who simply refused to eat broccoli or any other kind as it happens. Now he loves it! 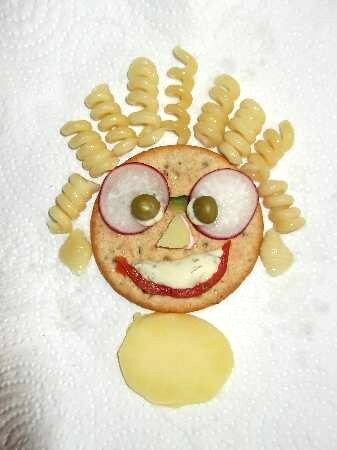 Round biscuits for the funny faces is the best, but you can use square for robot faces, a boys favorite. Use the cream cheese or taramasalata as bonding ingredients. 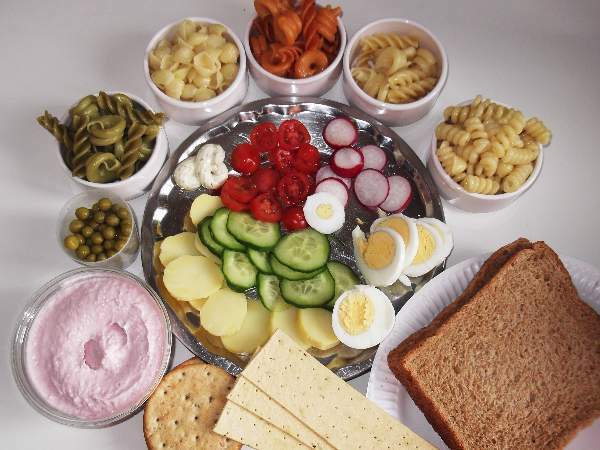 The taramasalata is a nice mild, creamy, fishy taste which kids really like and the pink adds color. We chose a cream cheese with chives but plain will do. Slice tomatoes, potatoes, egg, cucumber, and radishes and cut some in halves and quarters. A half radish looks good as a smiling mouth, and the half cucumbers as dog ears. 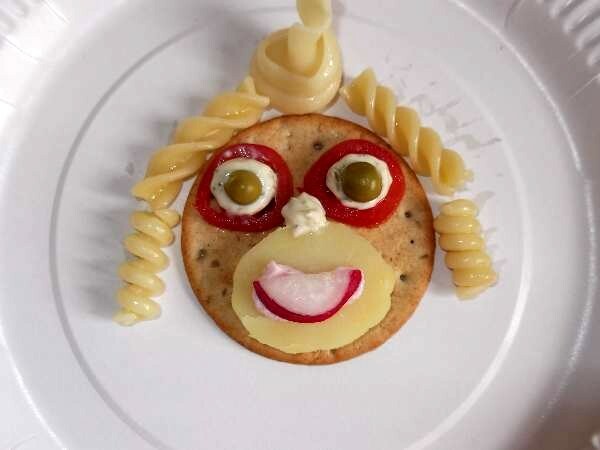 The kids can use their imaginations using the pasta for funny hair dos. The taramasalata came in useful as a face pack for the red head. For arms, legs, stems, etc., cut some potato into sticks or use long pasta. But cut straws can be used too. 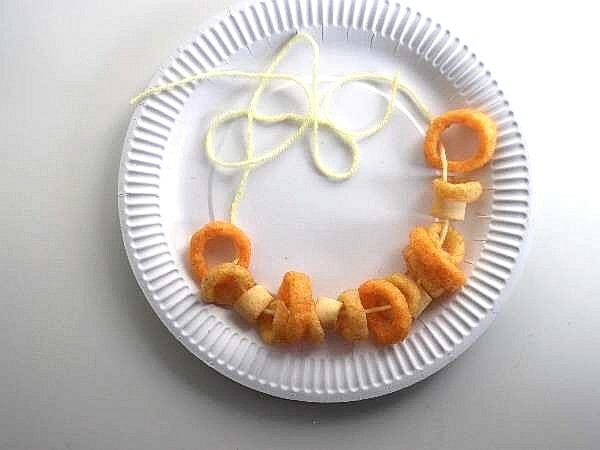 Children love to string things, and there are plenty of foods to make interesting edible jewelry. 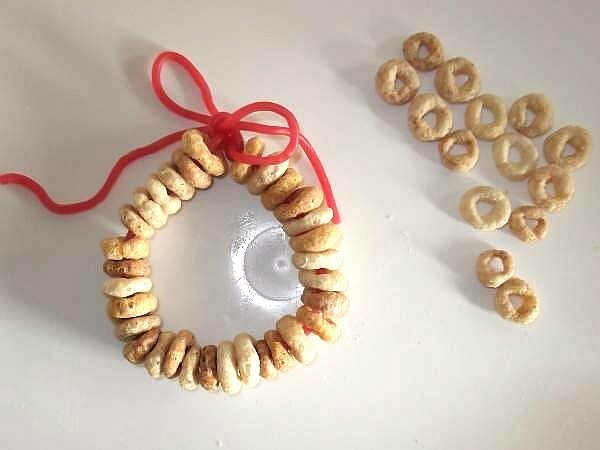 Here we have 2 savory selections made of hula-hoops, onion rings, and spicy tomato rings. Be careful that children do not tangle string or wool around their necks. A better idea is to use wool that breaks easily or thin elastic, and even then be cautious reserving this craft for 4+ years. 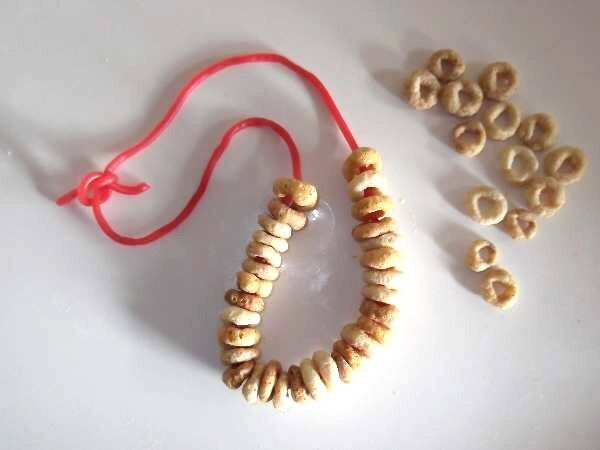 The sweet jewelry shown below is safer for younger children. 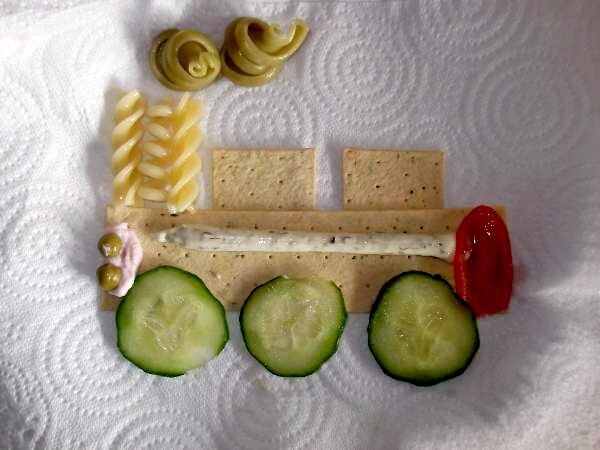 This summer flower garden is an example of how they can use long pasta and the train is made up of long savory dip crackers, pasta, and a length of cream cheese squeezed direct from the tube. See our flowers below in the sweet section for the use of straws . A slice of egg makes an effective sun. Suggest some of these ideas to the kids only if they need them. This information is to help the teacher or parent to set the stage so to speak. 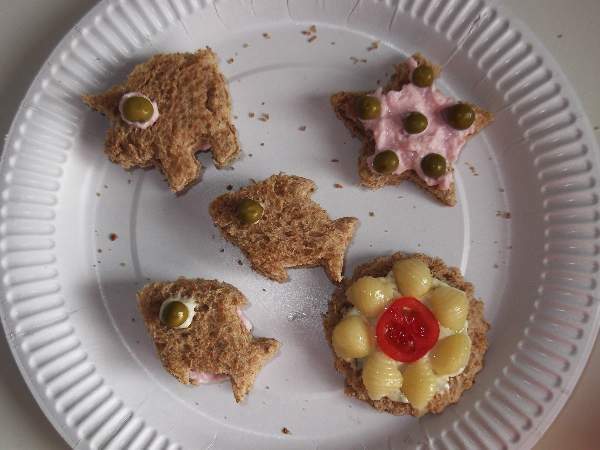 If you are planning a children`s party, here are some ideas they could easily make themselves. They are easy edible crafts for kids to do in preparation for it, and some would be great as party favors to take home. 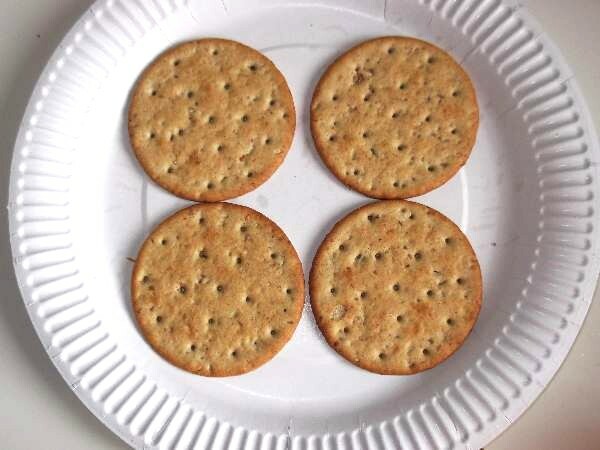 Cookie cut sandwiches are nice and bite size. The kids can pick out which cutter they would like to use. The fish look so cute and so do the piggies. 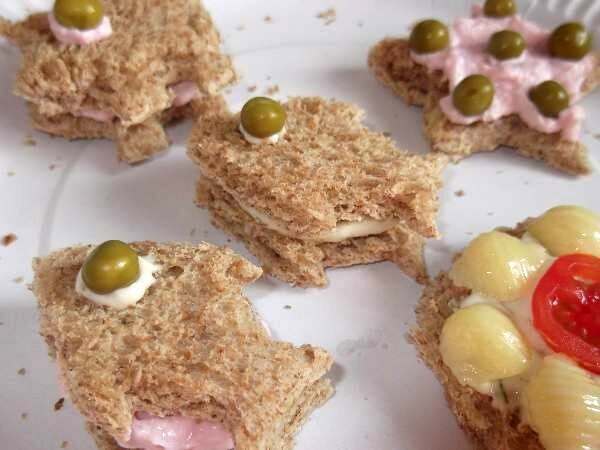 We spread a good helping of taramasalata on one fish and put another on top with a garden pea for the eye. 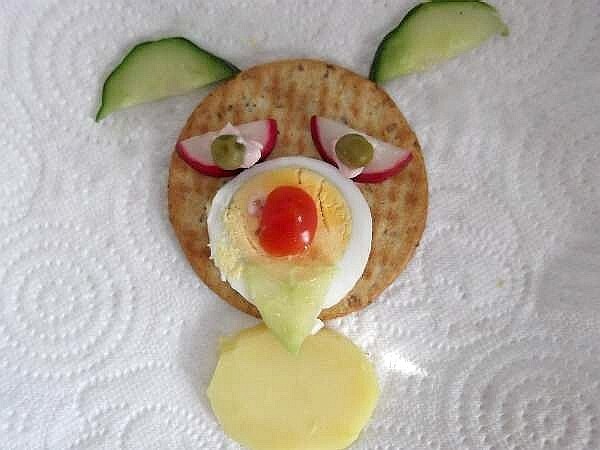 Some can be left open and decorated with cherry tomato slices and cucumber. Some children like savory, some sweet, but the latter may not want to make and eat the savory if they discover there are sweets on the menu. So don`t mix the two. Either have a savory session or a sweets one. Again the following ingredients are a suggestion. Choose wisely for healthy foods that are low in salt, sugar, and other hidden nasties, but be reasonable. 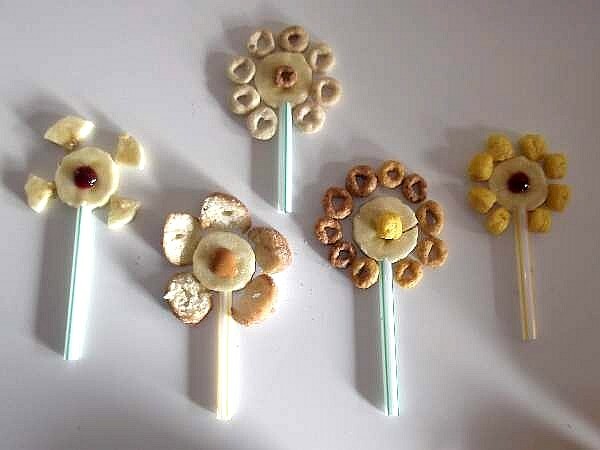 Some simple flowers can be made from banana slices and cereal. Here we have just used what was available at the time, straws. If you can think of an interesting food, by all means let us know. The peanut butter we used does not contain added sugar nor palm oil. It is very runny and needs mixing before use as the peanut oil tends to separate. 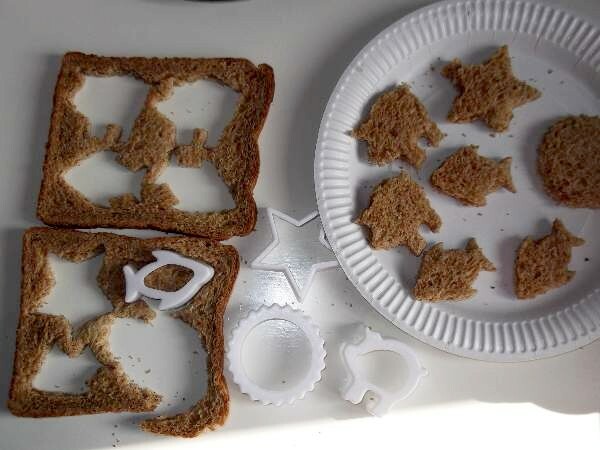 It`s a healthy alternative and easy for the kids to spread. The jam is made from Morello cherries, smooth with no bits which children prefer. Make sure when choosing jams and spreads that the tastes complement each other. Put the jam, peanut butter, and chocolate powder in separate dishes with spoons. 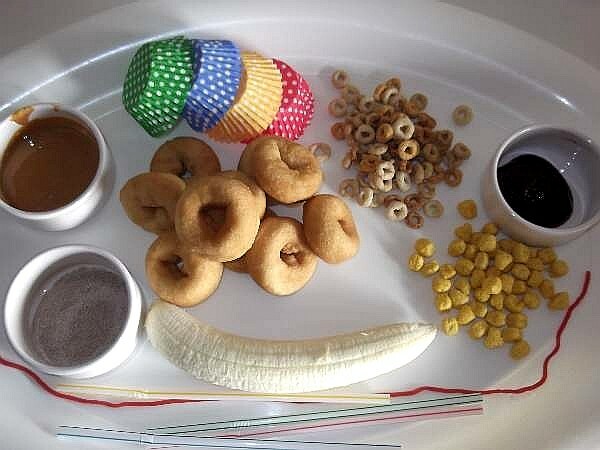 The children will have fun dressing up the doughnuts like cup cakes. 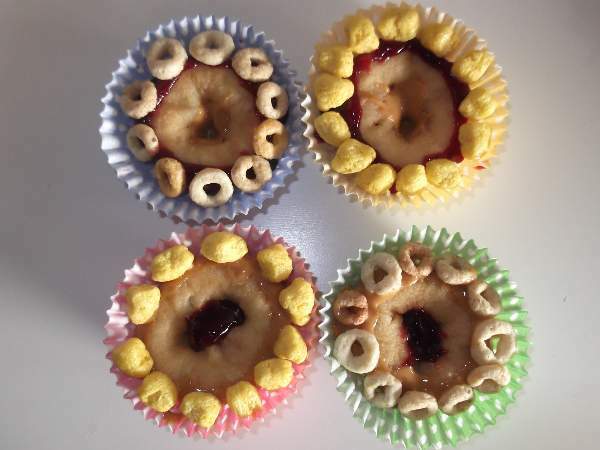 Cereals and fruit can be used for toppings. 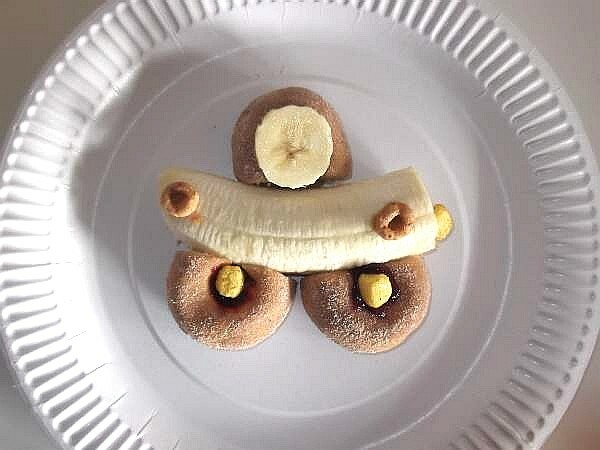 We used a quarter of a banana for the doughnut man, and rolled the doughnuts in the chocolate powder for the hot-wheels car. 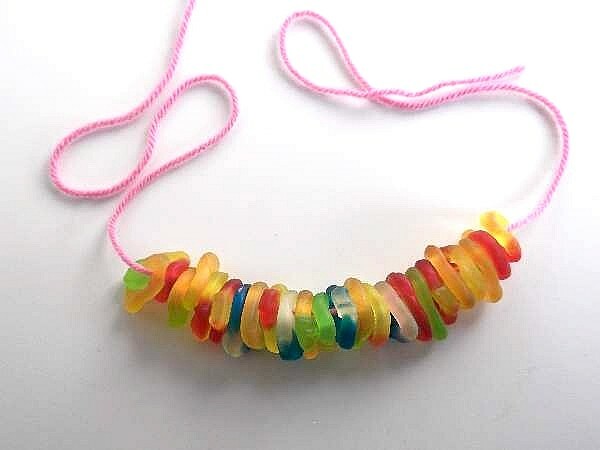 The strawberry licorice laces were ideal for our cereal bracelet and necklace. The kind we used do not contain gelatine and are made from all natural ingredients. They also break easily which is a safe material but could mean cereal all over the floor. They make ideal party favors though. Children can take them home to eat later. These jelly rings were too heavy for the licorice so we used wool. Elastic is a better choice for them. 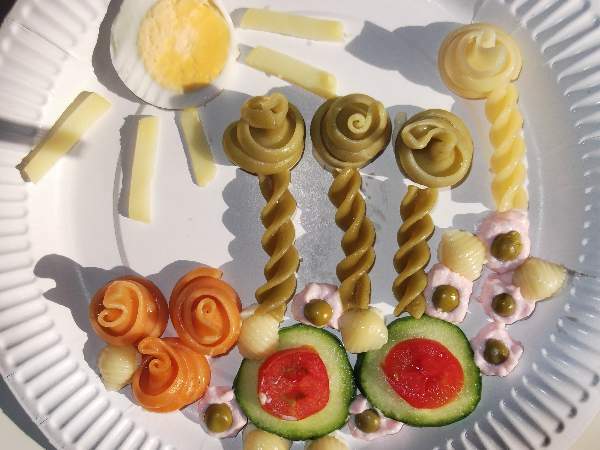 Have an enjoyable time making these edible crafts for kids, and please do let me know your own suggestions which we will post on this page.